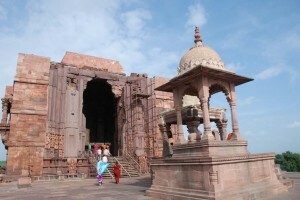 The temple, which has earned the nomenclature of the Somnath of the East, is known as the Bhojeshwar Temple. In plan a simple square, with an exterior dimension of 66 feet, it is devoid of the re-entrant angles usual in such buildings. 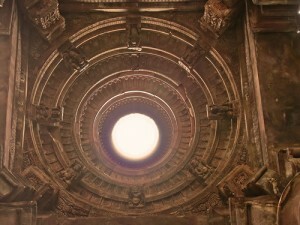 The richly carved dome, though incomplete, has a magnificent, soaring strength of line and is supported by four pillars. These, like the dome, have been conceived on a massive scale; yet retain a remarkable elegance because of their tapering form.Divided into three sections, the lowest is an octagon with facets of 2.12 feet, from which springs a 24-faced section. Richly carved above, the doorway is plain below, throwing into sharp relief the two exquisitely sculpted figures that stand on either side.On the other three sides of the structure are balconies, each supported by massive brackets and four intricately carved pillars, the lingam in the sanctum rises to an awe-inspiring height of 7.5 feet with a circumference of 17.8 feet. Set upon a massive platform 21.5 feet square, and composed of three superimposed limestone blocks, the architectural harmony of lingam and platform creates a superb synthesis of solidity and lightness. The temple was never completed, and the earthern ramp used to raise it to dome-level still stands. Had it been completed, it would have had very few rivals. As it is, even with the ravages of time, it remains one of the best examples of temple architecture of the 12th and 13th centuries. Also incomplete, and with a similar stone-raising ramp, is a Jain shrine that stands close to the Bhojeshwar temple. Three figures of the Trithankaras are contained within, one being a colossal statue of Mahavira 20 fee high, and the other two of Parsvanath. Rectangular in plan this temple probably belongs to the same period as the Bhojeshwar. West of Bhojpur once lay a vast lake, but nothing remains except the ruins of the magnificent old dams by which its waters were contained. The site was chosen with great skill, as a natural wall of hills enclosed the whole area except for two gaps, 100 yards and 500 yards these were closed by gigantic earthern dams. Faced on both sides with enormous blocks of sandstone, many being 4 feet long 3 fee broad and 2.5 feet thick, set without mortar. The smaller dam is 44 feet high and 300 feet thick at the base, the larger dam 24 feet high with a flat top 100 feet broad. These embankments held up and expanse of water of about 250 square miles. This great work is ascribed to Raja Bhoj, but it may possibly be of an earlier. The lake was destroyed by Hoshang Shah of Malwa who cut through the lesser dam, and thus, either intentionally or in a fit of destructive passion, added an enormous area of the highest fertility to his possessions, According to a Gond Legend, it took an army of them three months to cut through the dam. And the lake took three years to empty, while its bed was not habitable for thirty years afterwards. The climate of Malwa is said to have been considerably altered by the removal of this fast sheet of water. This entry was posted in Bhojeshwar, Madhya Pradesh and tagged Bhojeshwar Temple. Bookmark the permalink.